Lake Mburo National Park has greatly attracted many tourists who come for safaris to Uganda. Lake Mburo National Park is situated in the south west of Uganda the country near Mbarara district and is the closest Savannah reserve to Kampala city ( 3.5hrs drive), about 243km from Kampala, off the main tarmac road. The park lies between, 1,219metres and 1,828 metres above sea level between rolling hills and open grass valleys. More than 100 years ago, the area in which Lake Mburo is was a dry Agricultural land owned by two brothers, Kigarama and Mburo. One night, Kigarama dreamed that they were in danger. A heavy storm would strike and the whole area would flood thus killing them. Kigarama told his young brother Mburo to vacate the area but Mburo ignored his advice. Kigarama reallocated to the surrounding hills and within days there was a heavy flood which formed a lake drowning Mburo. Kigarama watched helplessly from the hills as his young brother drowned. This story is always told to the visitors on trips or safaris. Guided nature walks accompanied by a ranger can be organized and the ranger serves as a precaution in case a visitor walks into a Leopard or a Buffalo. The guided walks offer visitors a chance to admire nature and also get various information about the flora and fauna of the area. Near the Rwonyo camp, the road to the jetti provides a good platform to see a variety of birds and animals such as hippos. About two kilometres from the park there is a good plat form that overlooks the salt lick and excellent spot of seeing a variety of animals. Walks can also be organized in the Rubanga forest in which one will be overwhelmed by the variety of trees such as the sapium (a tall tree whose leaves turn red before falling). Other trees which we may see include Markhamia platycalyx and Erythrina abyssinica. These tour adventures have greatly attracted many tourists to Lake Mburo National Park. 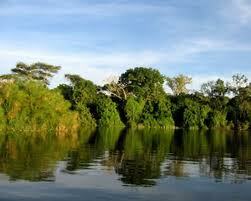 The motor boat trip on Lake Mburo is one of the most popular activities in the park. The trip gives the visitor opportunities for seeing the magnificent scenery viewing and good sightings of hippos, crocodiles, buffaloes, water buck, bush buck and water bird species such as African fish eagle, marabou stork, pied kingfisher, various egrets and herons. Ross’s turacco and Narina trogon are often seen in the lakeside thickets. The park hosts a variety of over 68 of mammal species, of which the impala, slender mongoose and bush rat, are not found in any other park in Uganda. Sadly, five species of mammals became extinct since the turn of the century. These are the lions, elephants, black rhino, giant forest hog and hunting dog. However, animals which are likely to be seen are, topi, bush buck, common duiker, oribi, deffassa water buck, bohor reed buck, buffalo, sitatunga, bush pig, eland, leopard, hyena, zebra, porcupine, hyrax, aardvark, hare, klipspringer, roan antelope, baboon, vervet monkey, galago, crocodile and monitor lizard. During the dry season, most of the wildlife is concentrated in the areas around the lakes, swamps and Ruizi River. However, during the rainy season, wildlife tend to occupy the park extensively and as standing pools of water dry, the wildlife tends to move back to the permanent sources.The sitatunga antelope is mainly found in the swamp interiors and the klipspringer is occasionally observed in the rocky areas. The park has over 310 species of birds. These include among others open water birds, lake shore and papyrus swamp birds, woodland birds, grassland birds and forest birds. Most of the park species of birds are “generalists”, that is, they can easily be seen anywhere. Birds of the open water in this park include pink-backed pelican, African darter, white pelicans, long-tailed cormorant and greater cormorant. Among the lake shore and papyrus swamp bird are fish eagle, pied kingfisher, African Fin foot, great white eaglet, night heron. The Park has many activities as described above and these have greatly attracted many tourists to come for safaris to Uganda.